The record breaking and Guinness World Record slot Mega Moolah from Microgaming just can’t stop paying out multi-million wins in 2018 with one each month so far. Mega Moolah is no doubt Microgaming’s biggest and most well known progressive jackpot slot machine to date. An oldie but a goodie this, Safari themed slot game combines 5 reels with 25 paylines full of zebras, giraffes, elephants, gazelle and more to provide you with the chance to win one of four progressive jackpots. With the biggest being the Mega jackpot which can quickly climb up in to the millions as you’ll soon find out if you read on. Much like the big NetEnt jackpot slots like Mega Fortune Dreams, Mega Fortune and Hall of Gods, the Mega Moolah jackpot game is popular with slots fans all over the world. It’s in pretty much every Microgaming casino site out there including a few of our favourites Casumo and Videoslots. But what intrigued us is not how quickly the jackpot rises over the 2 million mark but also how often the jackpot has struck in 2018 so far. With 3 wins over the 4 million euro mark in February, March and April and a €2,424,117.20 won on 14th January 2018, that brings this slots wins to a total of €16,162,361.79 so far this year. If it carries on like that for the rest of the year with a big win each month it stands to pay out over €50 million to lucky slots players. That’s a lot of lives touched by this casino game. Like we’ve already mentioned the first win of the year for the Mega Moolah slot saw one lucky player scoop just over €2.4 million on January 14th. That was followed by a win of €4,769,344.11 on 27th February, with the third win following closely behind just 9 days later at a staggering €4,365,843.63 on March 8th. That last win being won on mobile, meaning it doesn’t matter if you play via your phone, tablet or laptop you still have a great chance at scooping a life changing jackpot prize. The latest of the big wins was 19th April with the second biggest win of the year so far standing at €4,603,056.85. Want to know the best news if you win. There’s no waiting around for the cash either, no monthly payouts just one big lump some straight in to your account paid by Microgaming. 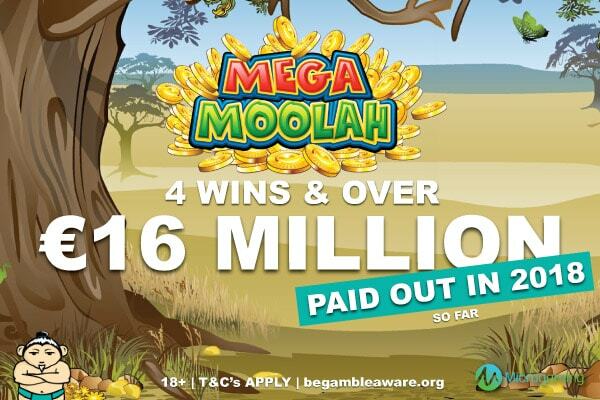 How much of that €150 million made in 2017 was from Mega Moolah we don’t know but it probably constituted to a lot especially as it includes the three other smaller jackpots that you’ll find in the game also paying out. That’s a huge amount! That’s not how much they’ve earned but given away to lucky players who manage to line up the right symbols in the right games and trigger the jackpot prizes. Granted Microgaming have been around for quite a few years so it might not seem that staggering. But with 2017’s payouts contributing to almost one sixth of that entire sum, it shows that jackpot slots are popular, and the payouts are only getting bigger and wins becoming more frequent as more players enjoy the games. The fact that there are now hundreds of casinos with Microgaming slots out there has helped the number grow and those top jackpot prizes grow even quicker than they used to. Plus there’re more than just Mega Moolah to play too. Another of their top jackpot games, but sometimes over looked is the Major Millions slot machine. It seeds at €250,000 and the Major Millions 5 Reel sot version added to the winning fiesta paying out a very decent €1,896,616.91 on 2nd February 2018. It doesn’t grow as big or hit as often but it’s still worth a look if you’re a fan of jackpot slot machines. Seeing as this game is a network progressive slot, the value of the win will be the same no matter which casino site you lay at. However, not all casinos treat their players with the respect and loyalty they deserve, which is why we only have a few recommendations to try out these jackpot games. The first is Videoslots casino. With over 2400 online slots and over 50 software providers you’ll never get bored here. With Casino Races, Weekend Boosters and Battle of Slots tournaments it’s got lots more to offer than most. Plus it offers players from UK, Canada, Europe and more the chance to take a spin. Our second recommendation is the quirky and fun Casumo casino. Offering GBP, Euro and CAD as currencies it gives players the chance to explore worlds via their bonus loyalty system, play slot tournaments to win free spins and cash prizes every day along with hundreds of slots from top slots studios. Plus jackpots from the likes of Microgaming, NetEnt and Yggdrasil there’s plenty of enjoyment to be had, and hopefully big wins too. Go see for yourself how much the Mega Moolah jackpot stands and see if a few safari spins will make you a jackpot winner today.